Chateau / Country House3013 sq. ft.
Near the village near the ocean and its beaches, in the heart of the forest. The house, all comfort, a lot of charm in its greenery with multiple exhibitions will welcome (8 pers. ): 4 bedrooms, 2 bathrooms, 2 toilets, fully equipped kitchen, laundry ... but also its annex nearby (4 pers. ) 2 bedrooms, 1 bathroom, wc, large living room, kitchenette, 2 large shaded terraces for family meals or idleness. But also its large intimate spaces nestled in the heart of the Landes forest and the doors of the ocean Contis and its sandy beaches. Everyone will find happiness whatever their age: rest in the shade of its century-old oaks, activities in the private and heated pool, ping pong, ball games, portico for children, and nearby sea bathing, surfing .... walks (on foot, on horseback, by bike, many bike paths and also mountain biking), fishing at sea, in the river or on the numerous surrounding lakes, golf, sailing, tennis. without forgetting to taste the famous gastronomy of the Landes, the wines of the south-west, and the traditional festivals of our villages. A bathroom with shower and large bath sink ensuite bedroom mirror; one second bathroom with shower bath, sink, mirror, changing table déservant the other rooms. A toilet per floor. A shower room with toilet in the annex. Pool 13X6 electric safety cover and barriers, wooden garden furniture with large table, parasol, plancha, 2 bicycles. NEAR: Dax 45km, Mimizan 25km, Ocean 7km, Lake 5km, River 1km, Shops 1km, Downtown 1km. 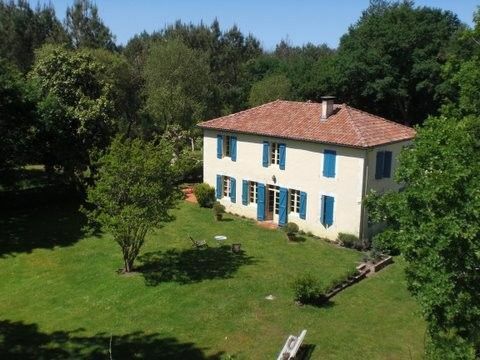 Easy access from the A10 motorway exit 14, Bordeaux or Biarritz airport at 1 hour, 30 minutes TGV to Dax, ocean 7km beach Contis, shops in the village 1km (markets, supermarket, bakery, butcher , newsagent, pharmacy, medical office, cinema). Located between Dax and Mimizan, near Moliets Regional Park, the museums, the Basque country and Spain, the wine trail and castles, ideally placed for all the family.